Yuzuvendra Chahal takes his maiden five-wicket haul in ODIs to help India beat South Africa by nine wickets in Centurion. In the post-match press conference, he is naturally upbeat. “I go for wickets, I flight the ball,” he says.“I know it can go for six too, but when your captain and your team back you, it gives you the confidence to do it. If your strength is to flight it, then flight it. When your captain tells you that, you don't have to worry even if you have been hit for two or three sixes." In an ironical twist, just one game after saying that, Chahal was plundered for six sixes at Johannesburg. South Africa went hammer and tongs at the Indian spinners, winning the rain-affected 28-overs-per-side affair by five wickets with cameos from AB de Villiers, David Miller and Heinrich Klaasen. The rain, as is often the case, made it very difficult for the leg-spinner to exercise any control and his strength of flighting the ball was nullified. Chahal, of course, is no stranger to operating in challenging bowling conditions. His IPL home is the Chinnaswamy Stadium in Bangalore, not exactly known for its size. However, the assault at Johannesburg appeared to have taken its toll and once de Villiers took him to task, Chahal quickly resorted to bowling flat and darting the ball in. However, if he thought that the agony was over, worst was to come. At the very same venue where he took a five-for earlier, Chahal was plundered for 64 runs in his spell of four overs in the second T20I against South Africa. Heinrich Klaasen, in particular, took a liking to him and hit 41 runs off just the 12 balls against Chahal with five sixes. 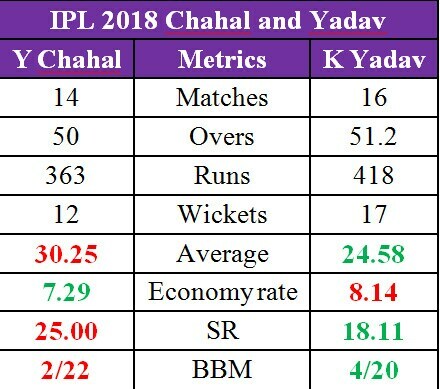 Chahal was at the wrong end of a couple of records that night. 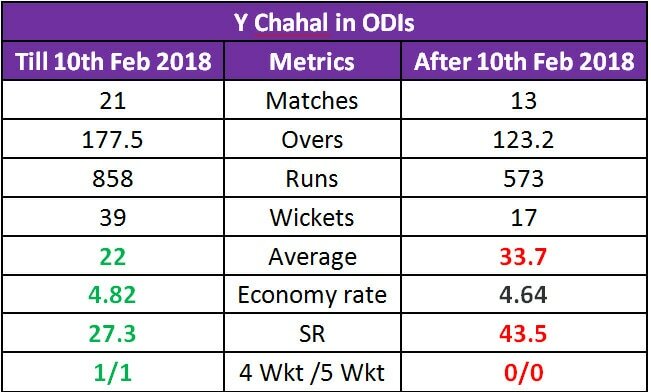 It is worth noting that in the two games India lost in South Africa, Chahal had an average of 132.00, going at an economy of 13.89 and conceding 13 sixes, while in the matches India won on the tour, he took 16 wickets at an average of 14.56. So his success was India’s success and vice-versa. However, since the hammering he received from Klaasen that night, Chahal hasn’t been the same bowler. As is evident from the table below, Chahal, since the T20I in Centurion, hasn’t been among the wickets like he was earlier. He didn’t have the impact expected of him in IPL 2018 as well for RCB. It was the first time in four years that Chahal had an average of over 30 and didn’t look threatening enough. Compare those numbers to his spin twin in Kuldeep Yadav and there is a stark difference. While Kuldeep went for runs in the game against South Africa as well, he has stuck to the mantra of not minding being expensive as long as he is taking wickets. Chahal,by contrast, seems to have gone into a defensive shell. In the ODI series against Windies, when Shimron Hetmyer was going berserk, there was a statistic on the TV coverage that said 99% of Chahal’s deliveries in the series were his standard leg breaks.He didn’t use the googly, which was surprising, especially when he was bowling to a southpaw. What has also not helped is the injury to Hardik Pandya at the Asia Cup. Pandya’s unavailability has meant the team has been forced to look for another all-rounder. So, India went back to Ravindra Jadeja in ODIs and Krunal Pandya in T20Is. 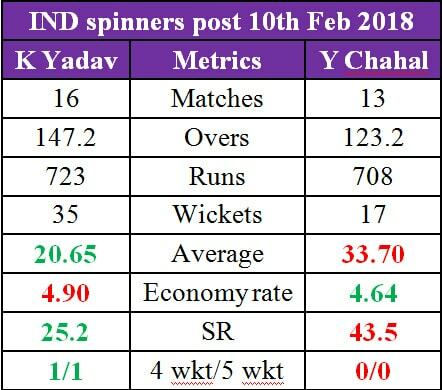 Since the team is missing the all-rounder, Chahal was now directly competing for the spot of the spinner with Kuldeep Yadav and the latter has emerged as a clear front-runner. Quite clearly, being benched at Brisbane in the opening encounter of the series wasn’t an entirely unexpected decision. However, Chahal has already shown that his skills are precious and Indian cricket would do well to find a way to nurture him back to wicket-taking ways.